Dimensions (HxWxD): 2.5" x 2.5" x 0.875"
This large St. George's Cross Staurolite, weighing 3.21 ounces or 91 grams, and measuring 2.5 inches across, is a AA quality specimen of the complex Staurolite crystal formation, and comes from Keivy, a city in the Kola Peninsula of far Northern Russia. True Staurolite like this specimen easily scratches glass. Staurolite is an extremely hard, ins oluble mineral formed from iron magnesium aluminum silicate, naturally occurring as reddish-brown orthorhombic crystals embedded in a matrix of metamorphic rocks high in iron and aluminium. The high hematite content gives Staurolite crystals their characteristic reddish brown color. 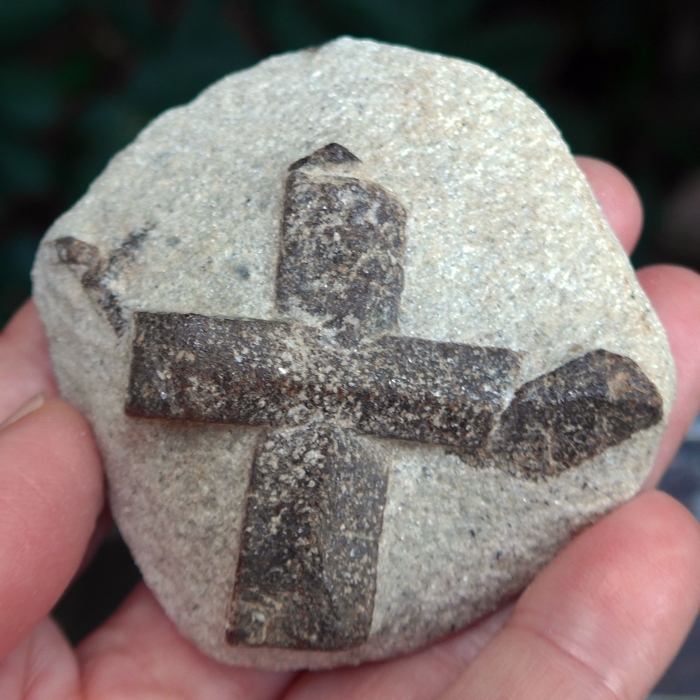 The name is appropriate because Staurolite crystals often appear in twin cruciform formations, in the shape of a Greek cross, with a 90 degree angle between the arms, or in the shape of a St. Andrew's cross, with a 60 degree angle between the arms. 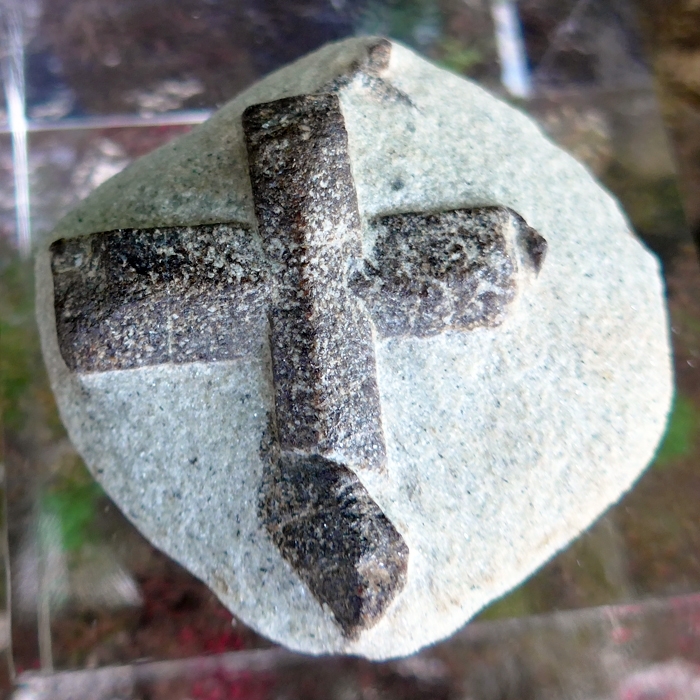 St. George Cross Staurolite is far more rare and sought after as a mineralogical collector's item, and is more expensive than St. Andrew's Cross Staurolite. The St. George Cross is a heraldic symbol in the geometrical form of an upright red cross on a white background, and appears on one of the official British flags. St. George is the patron saint of the United Kingdom. St. George was a Roman soldier venerated as a Christian saint from the 7th Century AD onward, and was said to have killed a dragon that was ravaging the Libyan countryside, saving a princess in the process. During the 11th Century, the St. George Cross was associated with the global fraternal order of the Knights Templar, bankers to the world and keepers of the Western Mystery School Teachings at that time. In the Twelfth Century, St. George was said to have re-appeared at the time of the Third Crusade to help Richard the Lionhearted in his battles with the Moslem Empire. 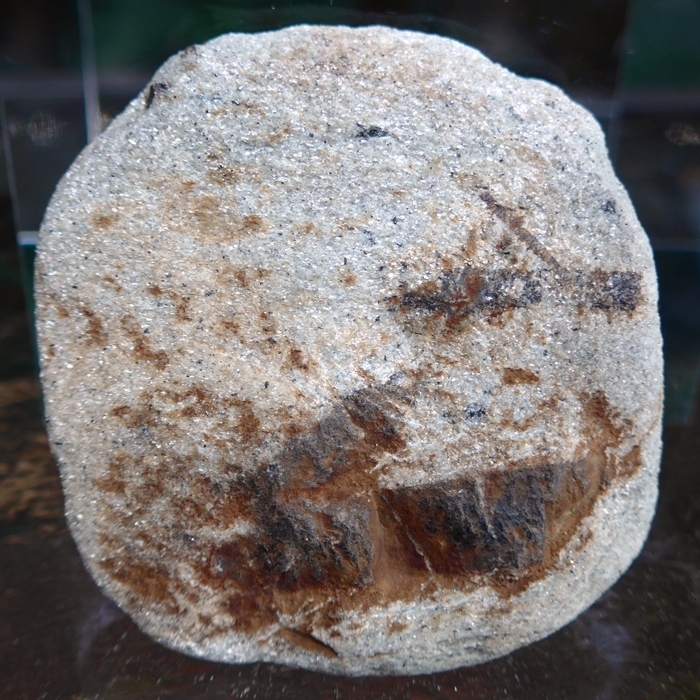 Another legend has it that Staurolite was used to heal Richard the Lionhearted during his Crusades in the Middle East, when he suffered from malaria. Staurolite cruciform twins in the form of the St. George's Cross have been worn by religious devotees through the ages, and are renowned as sacred natural objects, invested with the power to heal, bring good luck and transform the soul. 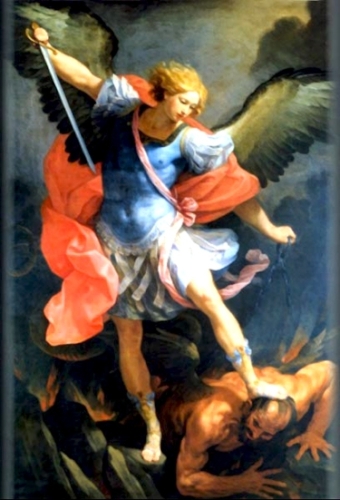 It is the high hematite content of Staurolite that gives it its characteristic red coloration, so metaphysically, Staurolite is a stone that resonates to the energy signature of Archangel Michael. For more information on Michaelmas, see "Libra Festivals: Michaelmas, Rosh Hoshanah, Ramadan and Navratri". Note: Weight above is shipping weight. Net Weight is 3.21 ounces or 91 grams.